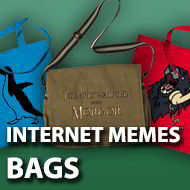 This section right here contains Internet meme related bags. Memes are those strange little animations and images found all around the Internet. All the thingies listed here celebrate their strangeness, weirdness and overall insanity. There has been an eruption of new Internet memes coming out all the time throughout the Interwebs. There are old classics like the 'lol cats' and 'All your base', and other oddities which you can find throughout the everlasting Interwebs. Fist I Cut For ..